Only beneficiary is Kim Jong-Un who has been legitimized as a world leader. From pariah state with an appalling human rights record to a special bond. No mention of CVID – that was the Secretary of State’s bottom line – Complete, Verifiable and Irreversible dismantlement/disarmament. No mention of the DPRK’s human rights abuses. We have been here before. This is from 1993. It also included an agreement to peace and security in a nuclear free Korean peninsular. 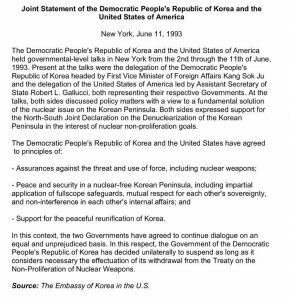 This was followed up with an Agreed Framework between the United States of America and the Democratic People’s Republic of Korea signed on October 21, 1994, between North Korea (DPRK) and the United States. The objective of the agreement was the freezing and replacement of North Korea’s indigenous nuclear power plant program with more nuclear proliferation resistant light water reactor power plants, and the step-by-step normalization of relations between the U.S. and the DPRK. Implementation of the agreement was troubled from the start, but its key elements were being implemented until it effectively broke down in 2003. So the new document from Singapore appears to add nothing. Despite all the hype. The depressing resemblance is to MacMillan returning to the UK in September 1938 with the signed Munich Agreement and lauding “Peace for our Time.” A year later Britain and Germany were at war. 2. Talk of “mutual confidence-building” suggests step-by-step process, meaning Trump admin is flexible on its previous insistence of CVID up-front. 3. 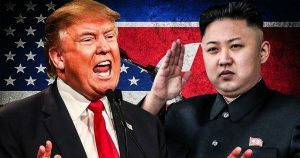 DPRK and U.S. will “join efforts” to build lasting peace — but no mention of getting it done before 2018, as per the 27 April 2019 agreement signed between the two Koreas. 4. Denucelarization will be of peninsula, not just NK. No change from 1993/1994. 5. No mention of missiles. It is just a few months since N Korean missiles were flying over Japan. 6. Text on MIA remains implies U.S. military figures will be visiting DPRK. 7. Commitment to “expeditious” implementation is good. But vague. No date. 8. No inclusion of issues raised by Japan. Such as the return or kidnapped Japanese taken to the DPRK. Follow up negotiations to be led by the US secretary of state and high level DPRK officials emphasizes that a long process lies ahead. I suspect the South Koreans will need to anchor those negotiations. Was a meeting necessary. Probably. If only to give Kim what he wanted – a seat at the negotiation table with the US President. But their agreement lacks any specifics. Trump fans will not mind. They will simply say that he achieved something that no other US President could. In the meantime US sanctions will remain in place which is the one item of leverage that the USA retains.